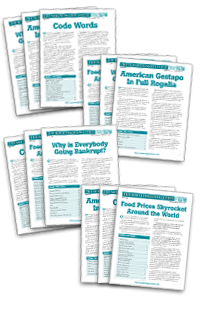 Enjoy 12 information packed issues of The Bob Livingston Letter™ delivered straight to your mailbox! But that's not all... you'll receive an e-newsletter version via email days before your printed copy arrives in your mailbox — so you can read it when you're away from home... on your smart phone, iPad, eReader, laptop or favorite device. As always, your satisfaction with The Bob Livingston Letter™ is guaranteed and you cancel at anytime for a complete refund of your subscription fee.